Brazil nuts (Bertholletia excelsa) belong to the Lecythidaceae family and technically they’re seeds (sometimes referred to as kernels). They are native to South America, found mainly in the Amazon rainforest, but they’re also found in Peru and Bolivia. The nut, like many other nuts, is protected in a thick, brown shell that needs to be cracked open to remove the seed. Also known as “para-nuts,” “castania” and “chestnuts of Brazil,” these large nuts have a smooth, creamy texture and a mild, sweet flavor. The health benefits of Brazil nuts are numerous, and eating 30 grams of them a day is a great way to boost your vitality and get some vitamins and minerals into your system, especially selenium. 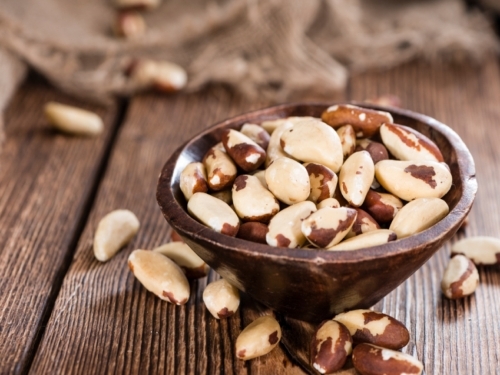 Brazil nuts pack an incredible health punch in a tiny package. Two nuts are all you need; they can provide you with a good source of many vitamins and nutrients, and your total daily selenium needs. 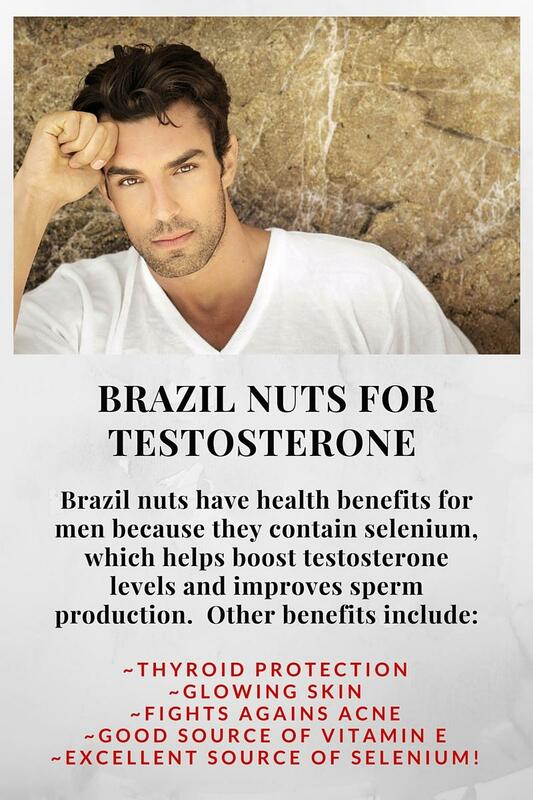 Brazil nuts have health benefits for testosterone as well; they are helpful for men with low testosterone counts, and can be a side-effect-free way to get those numbers up. From healthy skin to a properly functioning metabolism, the Brazil nut is a good addition to every diet. They may be a pricier choice than, say, peanuts, but remember that only a few are needed per day to gain benefits, so that tub of nuts should last a long while. That said, it’s a good idea to keep the nuts in the fridge to prevent them from going rancid, especially if you live in a hot and humid climate. Brazil nuts have health benefits for men because they contain selenium, which helps boost testosterone levels and improves sperm production and motility (1). Eating Brazil nuts for testosterone may be crucial for men with low sperm counts. If this is the case for you, add a few to your diet every day and then get tested again in a few months to see if levels have been raised. Discuss this with your doctor before stopping any treatments they may already have you on. Brazil nuts have health benefits for the thyroid, an important gland that regulates, produces, and distributes some of the most important hormones in our body. An active enzyme called triiodothyronine is in Brazil nuts, and it’s this enzyme that helps produce thyroid hormones. The thyroid (2) plays an enormous role in many bodily functions, including metabolism, regulating body temperature and appetite, muscle strength, and proper reproductive function. Eating Brazil nuts alone won’t help reverse any thyroid dysfunction, but they can go a long way in helping to prevent any disruptions and issues down the road. Selenium (3) is a mineral found in water and in some foods, and it’s essential for proper metabolic functioning. It’s an incredibly powerful antioxidant and with only two kernels of Brazil nuts, a person can get the full recommended daily allowance. Most people do not suffer from a selenium deficiency, but those with HIV and Crohn’s disease could have lower levels of selenium than others. Selenium poisoning from Brazil nuts happens very rarely but if you suspect this has happened to you, see a doctor right away. It won’t happen if you eat the recommended amount of nuts per day, but could happen if you overindulge and then also have even more selenium from other food sources or supplements. Signs of selenium toxicity include brittle hair and nails, digestive issues, a garlic smell on your breath, and metallic taste in your mouth. If this is happening, stop eating Brazil nuts and have a discussion with your healthcare provider. Brazil nuts have health benefits for the skin because of their selenium content. Selenium is a powerhouse mineral and a great antioxidant, and we need antioxidants to fight off free radicals that cause damage to skin cells, which causes skin to age and lose its luster over time. If more antioxidant-containing foods such as Brazil nuts are consumed, we have a fighting chance against this damage. Vitamin E is an antioxidant that is required for the development of red blood cells. It can also help boost the immune system and aid in better functioning of the cardiovascular system. 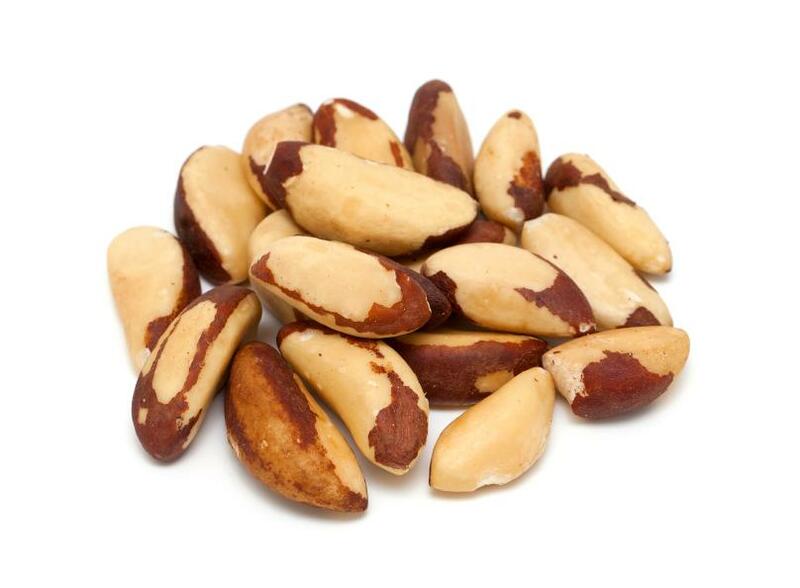 Brazil nuts are a good source of vitamin E; in 100 grams you can get about 52% of the recommended daily allowance. The high zinc content in Brazil nuts is good at fighting off acne and helping blemished skin clear up. Zinc works wonders against acne, so if this is an issue for you, enjoy a few nuts a day and see if they help clear your skin up naturally. Brazil nuts are versatile and have a mild flavor, so there’s a lot you can do with them—the only limitation is your imagination! Just be sure to not overindulge, because they’re high in fat and calories, and too much can lead to selenium toxicity. Just a few will supply you with a boost of vitamins, minerals, and nutrients. Brazil nuts can be added to salads and smoothies (they will blend up just fine) or they can be eaten by themselves. They can be crushed and then used as a healthy topper for desserts, puddings, and yogurt. You can also bake with them. Brazil nuts are a common addition to the traditional Christmas fruitcake recipe. 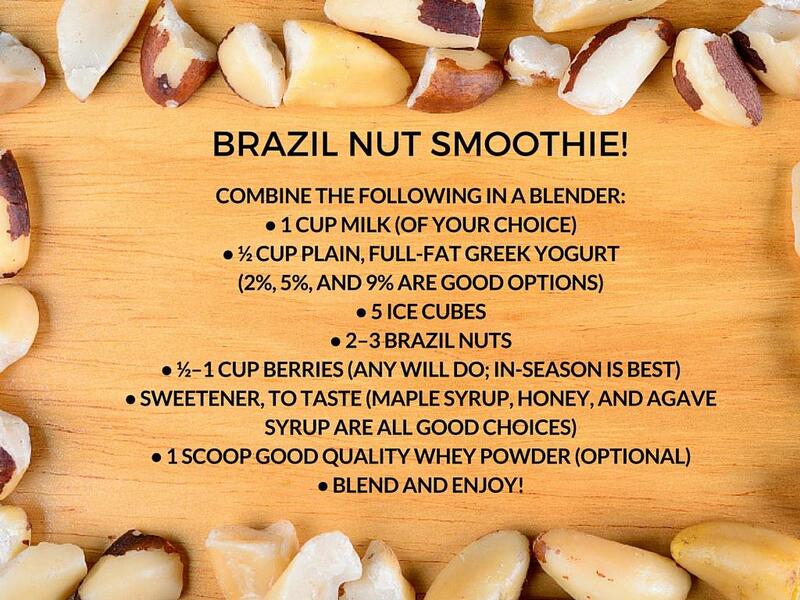 Below is a wonderfully satisfying fruit smoothie recipe made with Brazil nuts. Brazil nuts taste delicious raw, or with a bit of salt. Provide 100% of the daily recommended value of selenium in just two nuts. Can Eating Nuts Lower Your Risk of Death?